Sorry for the late listing of this Fair – I only read about it in today’s paper! Not my fault if the organisers can’t be bothered to do a rudimentary internet search to see where they could list. Mealy’s (Dublin) July Sale of the Fred Hanna Collection beats all superlatives! Fred Hanna and his wonderful bookshop on Nassau Street were a Dublin institution, and its passing and that of Fred himself, earlier this year, are deeply regretted. Many of you will want to attend this sale and purchase a copy of the superb catalogue just as a keepsake of the occasion! I could use all the usual cliches to describe this sale but this one will do ‘there’s something for everybody here” and there truly is. Estimates are very reasonable but as there are some seriously rare items here you can expect to pay top dollar – recession or not! Amongst those items that caught my eye were Lot.74. A signed copy of “The Way that I went” by Robert Lloyd Praeger – Est.€200/€300; the rare Taylor & Skinner “Maps of the Roads of Ireland” pub.1778 and hard to find one that has been broken down by map dealers – Est.€700/€1,000; a signed copy of Flora Mitchell’s “Vanishing Dublin” – another book that dealers break down – Est.€400 -€600; Lot.462. 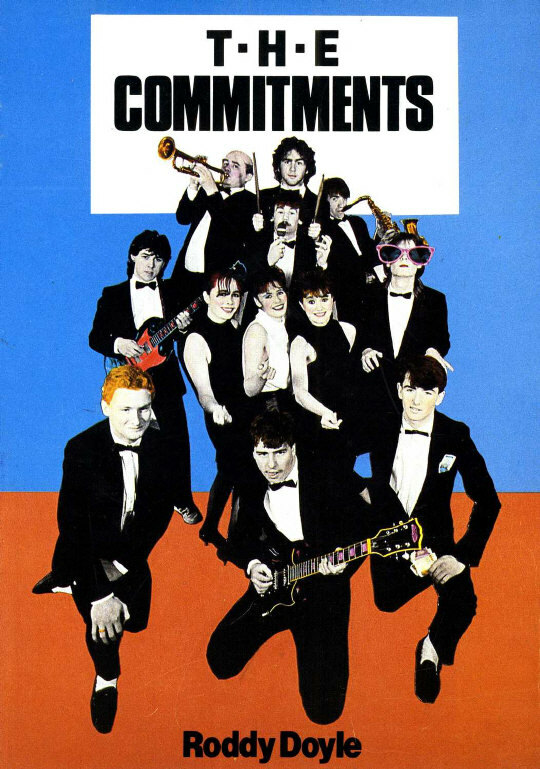 “The Commitments” by Roddy Doyle (1st edition) – Est.€400/€600; Lot.608. the ultra rare “Migration of Birds as observed at Irish Lighthouses etc.” by RM Barrington – Est.€800/€1,200 – and finally Lot.502. 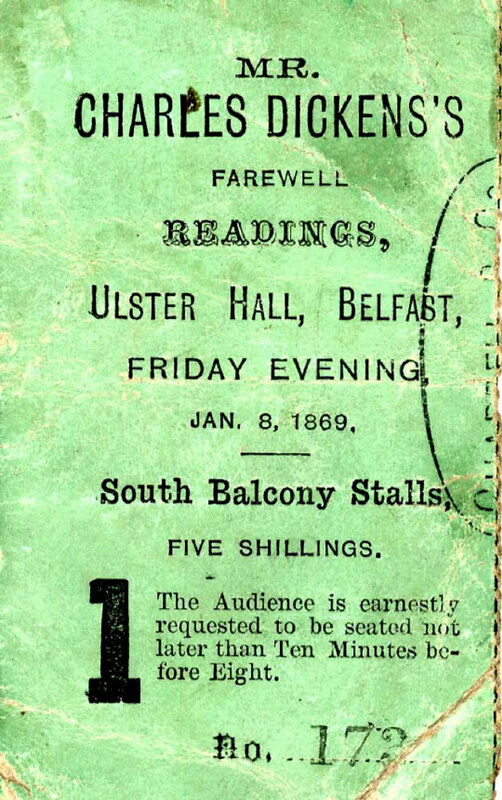 an incredibly rare piece of ephemera – a ticket for Mr.Charles Dickens’s Farewell Readings, Belfast, January 1869 (he died the following June) – Est.€180/250. On: Tuesday 19th July, 2011 at 11.30am sharp! At: The Berkeley Court (D4) Hotel, Lansdowne Road, Ballsbridge, Dublin.4. Viewing details see Auction page. Mealy’s Rare Book Sale brings out the buyers! Joyce and Sean O’Casey amongst the star items! Mealy’s Rare Book Sale which was held on December 14th, 2010 at the Berkeley Court (D4) Hotel in Ballsbridge achieved some strong results with the highest price (€15,000) being paid for Lot.671. a signed, limited edition volume by James Joyce, with the next highest (€10,500) going for Lot.585. a bound volume of hand-coloured Caricatures by early 19th century artists including the notoriously anti-Irish George Cruickshank, and (€10,000) for Lot.537 a collection of letters written by Sean O’Casey. Hopefully the latter were acquired by the National Library who, according to the Irish Times, were amongst the buyers at the sale. Some detail from the catalogue description here – worth the read – for me anyway. O’Casey mentions his current work in other letters, ‘I am writing, trying to, another volume of ‘biography’ & am jotting down notes for a possible play. I have written some things for Soviet magazines – I have been in close touch with Soviet theatre and literary activities for ten or twelve years; & I write an occasional article for the Daily Worker.. I hope this year may see the end of Hitler, so that we may begin to build another country in earnest.’ (1 Jan. 1944). 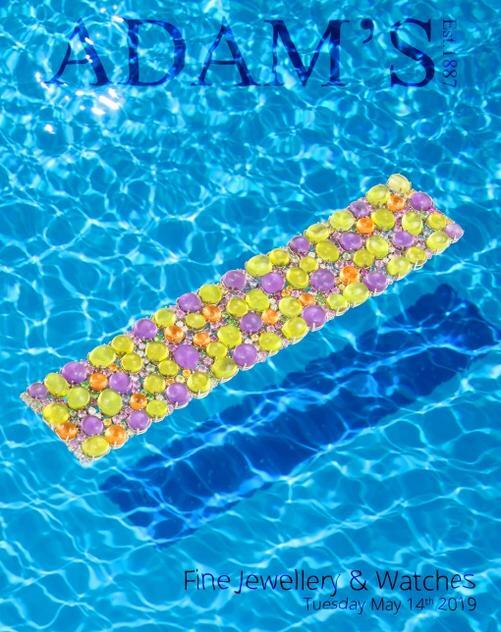 There are comments on his family life, with his three children aged between 4 and 15. ‘I and the missus have to do everything ourselves now; and it means a continuous go from early morn till late at night, so that I can’t think of my own work till 10 o’c. when they are all abed. i usually stay up till 2 a.m.’ (1 Jan. 1944). He refers to his poor health – ‘My eyes, of course, will never be better than they are; but on the whole they have served me well, seeing more, often, than others that are vigorous and keen’ – and to the wartime bombing, ‘Plymouth got a very bad raking indeed – perhaps the worst in the country. Our little town got a shake up recently, the shops and buildings show signs of being badly gashed.’ (8 Dec. 1942). 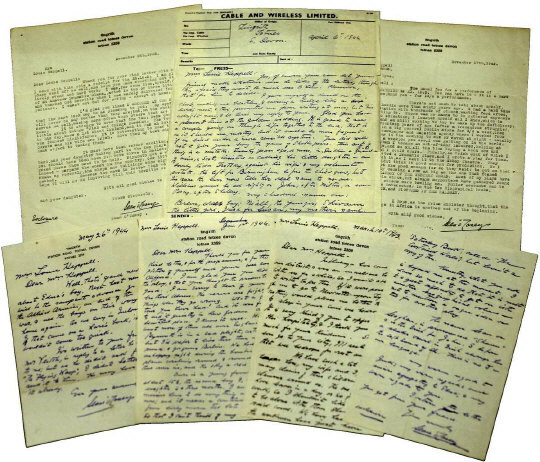 The envelopes have all been reused by O’Casey using addressed labels – a typical wartime economy. Mrs. Heppell’s replies are not present. Just a reminder, as if you could forget with all the hype surrounding it, that Whyte’s sale is on this coming Saturday. Viewing: Wednesday to Friday 10-12 November, 10am-6pm; Saturday 13 November 9.30am-12 noon. 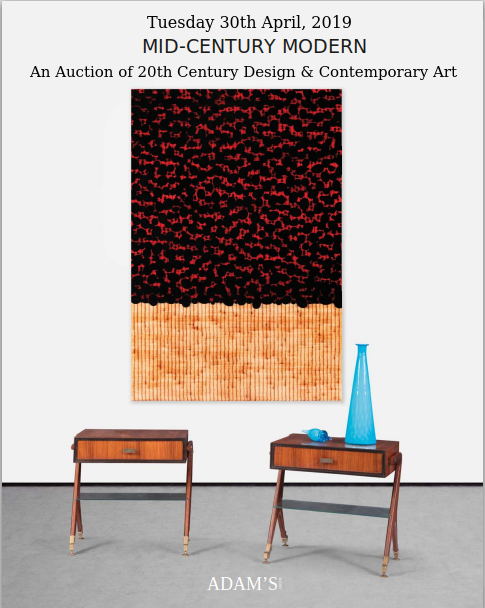 Venue: Viewing at Whyte’s Molesworth Street Galleries; auction at Freemasons Hall, Molesworth Street. Includes rare flags and banners such as 1867 Fenian Rising, 1898 Land League, 1914-21 Irish Volunteers and 1944 Wehrmacht, weapons and medals from the 1916-21 War of Independence, 1798 Rebellion manuscript, letters and manuscripts of Daniel O’Connell, Charles Stuart Parnell, Liam Lynch, Mussolini, Irish regiments in the British Army militaria, 1688-1691 collection of James II “Gunmoney” from the Williamite Wars and other coins from 1014 AD to the 20th century, Irish sporting memorabilia including 1901 Bohemians v Preston programme, GAA and rugby medals etc., collection of Irish and British banknotes, 1814 to 1960s, 571 lots, estimates €100 to €50,000. Full report including video link further down this page. You won’t want to miss this one! At: The Freemasons Hall, 17 Molesworth Street, Dublin.2. Theatre and Cinema, Advertising Ephemera, Sport, Antiquarian and Collectable Books, Coins and Tokens, Banknotes. 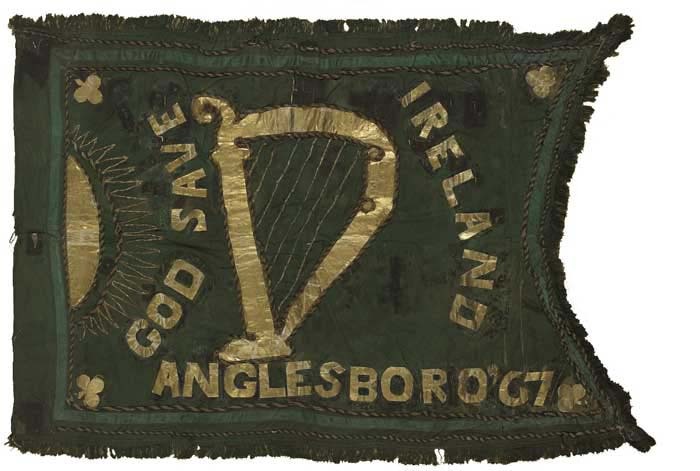 Fenian flag from 1867 - estimate €30-50,000. Don't buy it if you have moths! Viewing: At Whyte’s Galleries, 38 Molesworth Street, Dublin.2. “J. Morris Fitzgerald late soldier in Coll. Henry Perkins own troops “ selling his land to Robert Browne. The original grant was in 1651, witnessed by Humphrey Butler, Samuel Conaley and John Magher. With signature and seal of Maurice Fitzgerald. €300-€400 (£260-£350 approx.) – the origins of my own family in Ireland. Other lots include a vast array of antiquarian books, medals, flags, political ephemera, firearms, swords, uniforms, IRA/UVF memorabilia, RIC, British Army, photographs, ephemera from the H-Blocks, coins, banknotes, and GAA/Rugby and Soccer medals/programmes etc. Hopefully some of the material will end up in museum collections. 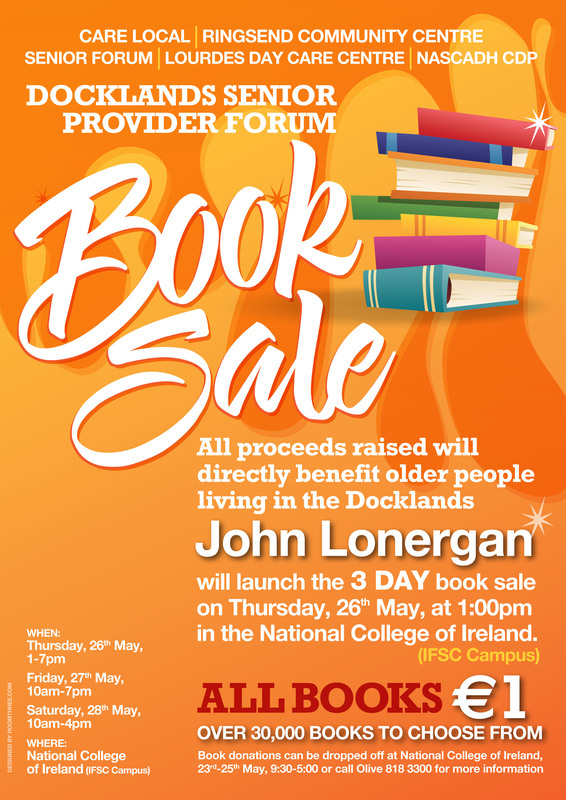 IRISH BOOK AUCTION – 914 lots. On: Thursday 7th October 2010. Tuesday 10am-6pm; Weds 10am-8pm and Thurs.10am-6pm. 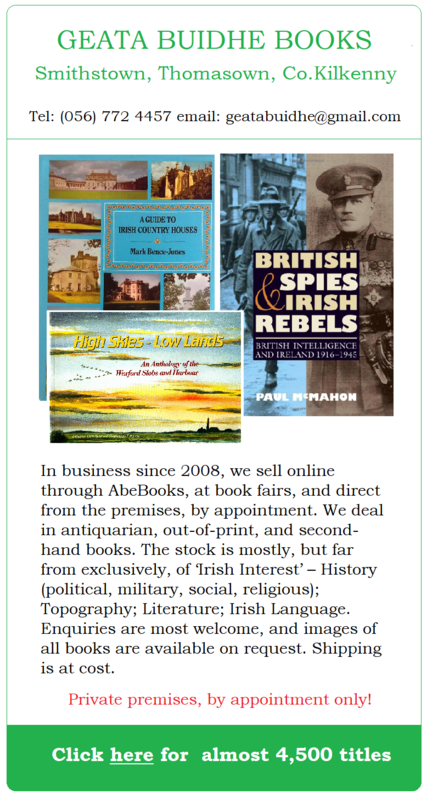 Private collection of Irish interest books including travel, local history, reference, plus 1st editions and many rare items. Amongst the many interesting lots I discovered a copy of the elusive Taylor and Skinner’s Road Maps of Ireland first published in 1777– the copy included in this sale is the 3rd edition a 1960s reprint but almost as hard to find as the original. 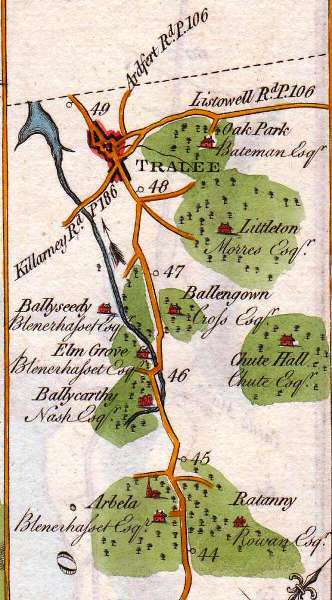 A hand coloured map from the 1st edition. As far as I can remember the reprint only has uncoloured maps. 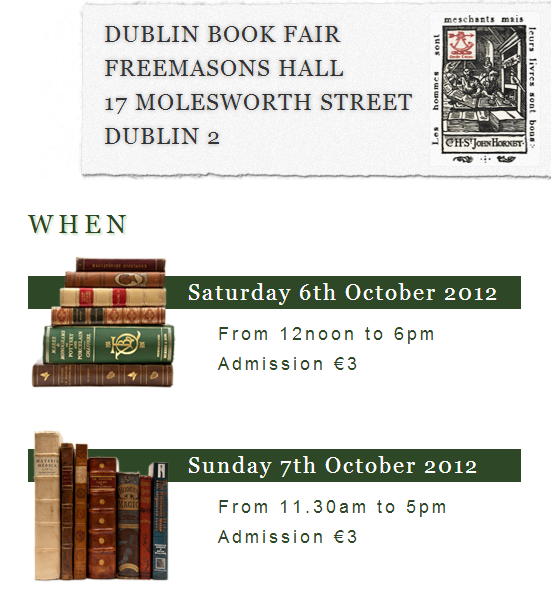 Not to be confused with the Dublin City Book Fair, this event takes place at the Freemasons’ Hall on Molesworth Street. It runs from 12 Noon – 7pm on Friday 17th and from 10am – 5pm on Saturday 18th. I had a scroll through the catalogue and there is a bit of everything – including rare Irish interest books, signed editions, sporting programmes for GAA/Rugby etc, modern film posters, coins/banknotes etc. Well worth looking through the catalogue. Also worth noting that Mealy’s buyers premium is now 20% incl.VAT! Tuesday next will see this very interesting sale held in the D4 Hotel (formerly the Berkeley Court, Ballsbdridge, Dublin.4. Viewing on Sunday 13th: 1.00pm – 7pm & Monday 14th: 10.30am – 8pm. Amongst the many lots I spotted several early signed works by the late John McGahern; Taylor & Skinners Roads of Ireland (1777); Musgrave’s history of the 1798 Rebellion and the always popular Vanishing Dublin by Flora Mitchell.